We welcome you to the web site of the Benedictine Sisters of Baltimore, a community of monastic women who follow the Rule of Benedict. Through our prayer, Liturgy of the Hours, and a variety of ministries, we endeavor to bring the richness of a 1500 year tradition into today’s world. 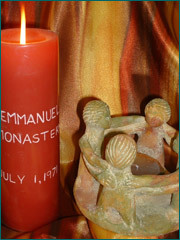 Sharing a common life at Emmanuel Monastery, we welcome all who seek God. …then journey through our website!